Totem Tribe is a fun mixture of adventure, real time strategy and hidden object gameplay come together for the first time. Restore balance to a dying world and find enough treasure to last a lifetime ! Aquaball is a visually stimulating and addictive new Arkanoid game with 140 exotic levels of fun gameplay - keep one or more balls in play as you shatter seashells and enter protected treasure troves. Svetlograd is an exciting color-matching game for PC in which you protect your city from evil imps. Upgrade your cannon, use wild bonuses and find ancient treasures hidden throughout the levels. 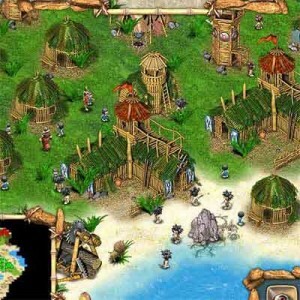 In the action puzzle game Jurassic Realm you explore an ancient land in search of images of long-lost dinosaurs. The full version of this PC puzzle game features 150 brick-busting levels. Alex Gordon is a fun PC platform arcade game about a cat with a hero's heart and adventure flowing through his veins - explore exotic game worlds and overcomes a cunning nemesis !